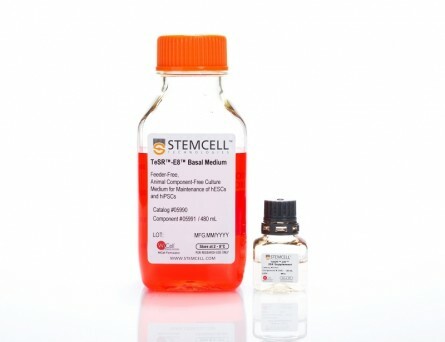 TeSR™-E7™ (2-Component) is an animal component-free and defined reprogramming culture medium optimized for the generation of human iPS cells without the use of feeders. It is based on the E7 formulation published by the laboratory of Dr. James Thomson (University of Wisconsin-Madison). 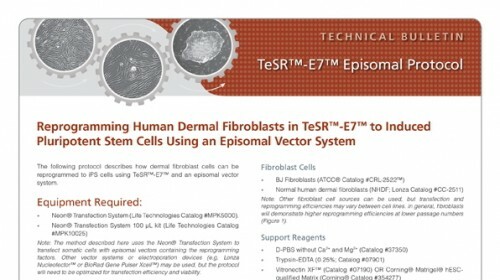 TeSR™-E7™ can be used during the entire induction phase of reprogramming (day 3 to 25+). 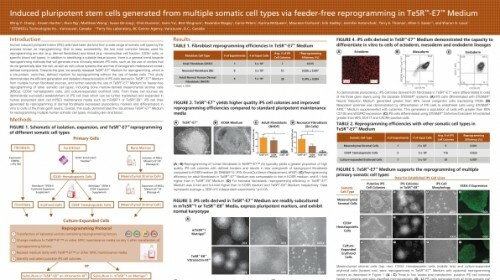 Following reprogramming, iPS cell colonies can be isolated and propogated in feeder-free maintenance systems (eg. mTeSR™1 or TeSR™-E8™ media on Corning® Matrigel® or Vitronectin XF™ matrices). (A-B) Small clusters of colonies with an epithelial-like morphology will appear by one to two weeks following induction (see arrows). (C-D) These clusters expand into pre-iPS cell colonies by two to three weeks. (E-F) Larger ES cell-like colonies are clearly identifiable by three to four weeks. Representative colonies from adult human fibroblasts reprogrammed with episomal vectors containing OCT-4, SOX2, KLF-4, and L-MYC are shown. 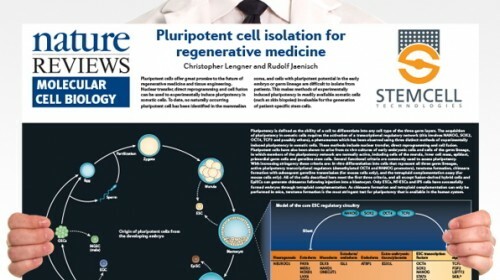 (A) TeSR™-E7™ generates colonies with defined borders and less overgrowth of background fibroblasts compared to (B) KOSR-based iPS cell induction medium. Representative colonies from adult human fibroblasts reprogrammed with episomal vectors containing OCT-4, SOX2, KLF-4, and L-MYC are shown. 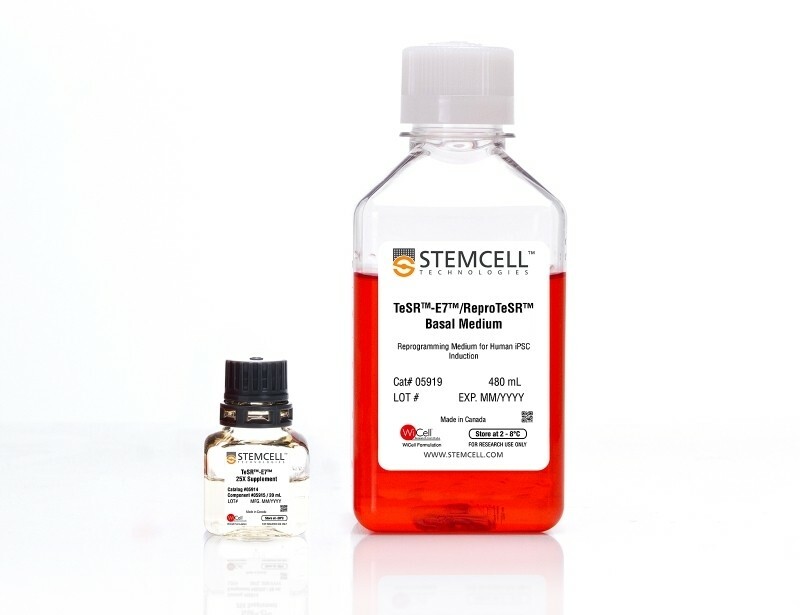 (A) TeSR™-E7™ yields easily recognizable iPS cell colonies with defined borders. (B) Unqualified components can result in colonies that have poorly defined edges and higher levels of differentiation. Representative colonies from adult human fibroblasts reprogrammed with episomal vectors containing OCT-4, SOX2, KLF-4, and L-MYC are shown. 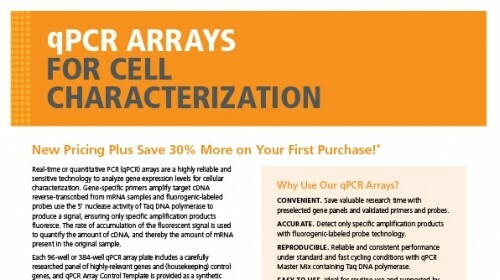 (A - D) iPS cell colonies generated in TeSR™-E7™ and expanded in either mTeSR™1 on Corning® Matrigel® (A-B) or TeSR™-E8™ on Vitronectin XF™ (C, D) exhibit classic ES cell morphology with dense colony centers, defined borders, prominent nucleoli and high nuclear-to-cytoplasmic ratios. 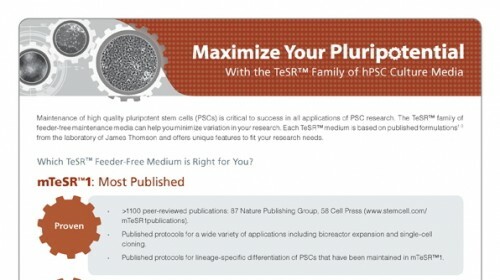 (E) iPS cells express high levels of pluripotency markers after just two passages in either mTeSR™1 or TeSR™-E8™ as demonstrated by OCT-4 and SSEA-3 flow cytometry analysis. Data are expressed as mean ± SEM, n = 4. Reprogramming of (A) adult normal human dermal fibroblasts (NHDF, 33 year-old female) and (B) neonatal foreskin fibroblasts (BJ cells) with episomal reprogramming vectors are shown. 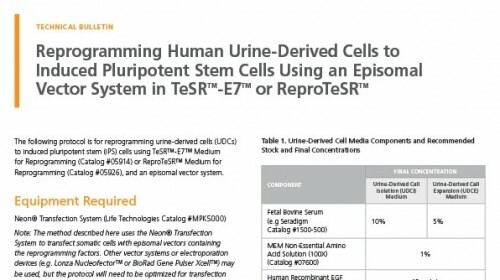 TeSR™-E7™ demonstrated similar (in NHDF) or greater (in BJ cells) reprogramming efficiencies compared to KOSR-based iPS cell induction medium. TeSR™-E7™ demonstrated higher reprogramming efficiencies compared to TeSR™-E8™. Data are expressed as mean ± SEM, n ≥ 6, * p ≤ 0.05.
iPS cell lines were generated in TeSR™-E7™ medium, maintained in mTeSR™1 or TeSR™-E8™ media for a minimum of 5 passages and karyotyped by G-banding karyotype analysis. Three iPS cell lines were analyzed and all demonstrated a normal karyotype; a representative karyogram is shown. 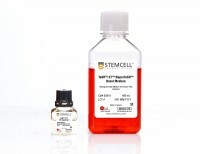 TeSR™-E7™-derived iPS cells were differentiated into all three germ layers. 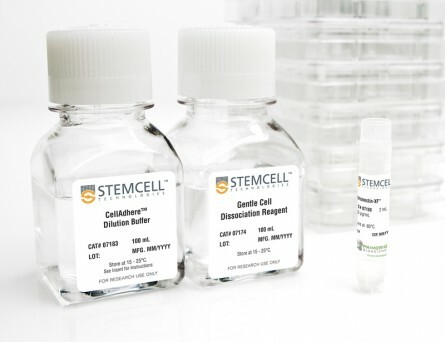 Endoderm specification was achieved using the STEMdiff™ Definitive Endoderm Kit, results demonstrated 93.6% SOX17 + CXCR4 + cells. 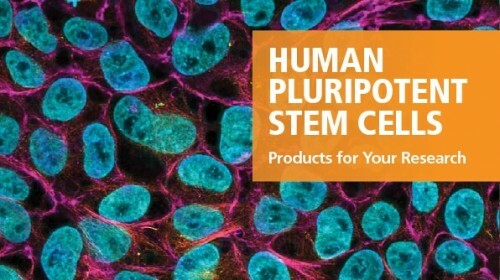 Mesoderm specification was demonstrated using a STEMdiff™ APEL™ medium-based endothelial differentiation protocol, results demonstrated &ht;99% CD31 + cells (data not shown) and 84.8% VEGFR2 + CD105 + cells. Ectoderm specification was demonstrated using STEMdiff™ Neural Induction Medium, immunocytochemistry shows high levels of PAX6 staining with no detectable OCT-4 staining by day 9 of neural induction.